It’s time to enjoy Daikon radish. In winter, you especially see many daikon radish at the supermarket. Daikon radish has plain and a bit bitter taste so it’s good for grating, simmering, steaming and grilling etc…This time, I would like to introduce simmered daikon radish with miso sauce on top called “Daikon no dengaku miso”. This is also simple, easy and yummy recipe! You’ll simmer daikon radish with kelp and Japanese rices until it becomes almost transparent color. (it’s kinda magic!) Then, put bonito flakes to add more comfort flavor. 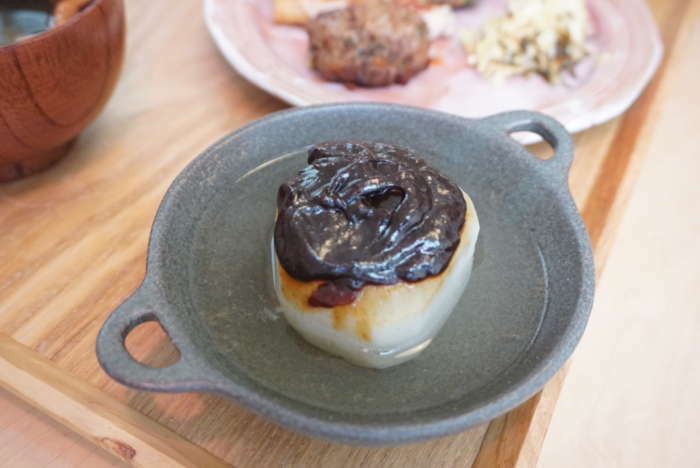 After taking out the daikon radish from the pot, we then put special sauce made of dark brown miso called Haccho-miso. This sauce is AMAZING! You can put this sauce for many other dishes. Enjoy Japanese cooking! I met some of my cooking class guests who don’t usually eat pork but chicken. In Japan, people tend to eat more pork rather than chicken. Of course, there are so many delicious Japanese foods with using chicken. My family and I like chicken a lot! This is a recipe for chicken lovers like us! 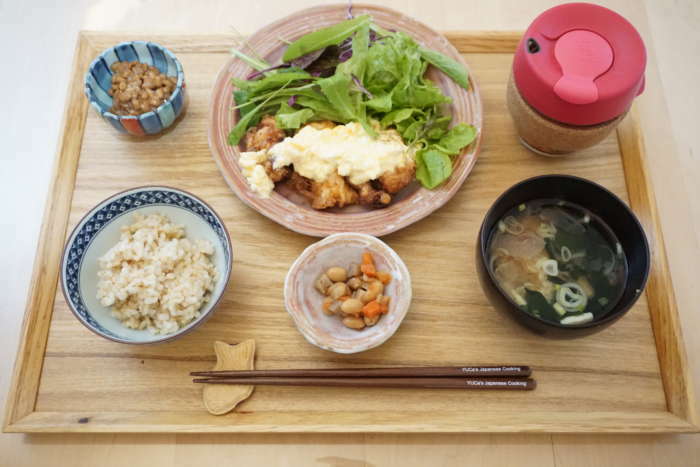 Today’s dish “Chicken Nanban” is one of the Japanese home meals. “Nanban” is a type of dish which has been influenced by Portugal or ethnic countries in our history.”Nanban” dishes are usually either fried or used onion and peppers in a sauce. I love this secret sauce! In this recipe, I cut the chicken into bite-size pieces since I have a small child. But normally, we open the chicken with using knife to be thinly. So, it’s your choice. 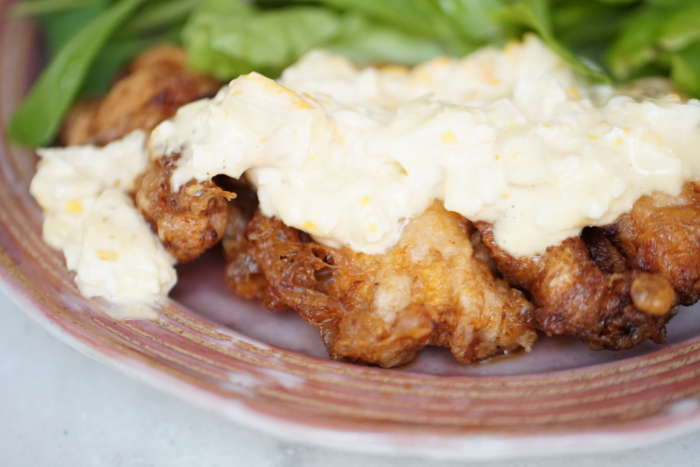 In addition to this fried chicken, we add tartar sauce made with boiled egg, mayonnaise and onion. This tartar sauce goes well with this salty and sweet sauce. So tasty and so special! Please try it out!! Hello, everyone! I have a news today!! Guess what? Yes! I am now creating my first cookbook!!! It’s been a secret but one of my dreams are publishing a cookbook. Since this is my first cookbook, I wanted to try something special and fun!!! 1. Entrepreneurial stories – Many of my cooking class guests asked me how I started this cooking class business, challenges I had and what I am now. I couldn’t tell my story in detail during cooking class, but I noticed that so many people are interested in living their dreams. It was not so easy for me in the beginning. Honestly, I once thought that I should stop doing this business etc. I hope you’ll get something new and sparkling things from this book. 2. The first 50 supporters! – Here is the early-bird prize. The first 50 supporters have a chance to write support message for this project. I have been supported by many people since I started my cooking class business. This made me want to try crowd funding and make a special cookbook with my supporters! 3. Rewards – To publish this cookbook, I would like to raise funds. As a reward, I prepared various goods. Those goods are original tote bag, denim bag, Apron and Chopsticks. Of course, those products are sold at my classroom and YUCa’s Japanese Cooking online store only. Now is the time to get those goods as well. Very exclusive!! I hope you enjoy this journey with me! 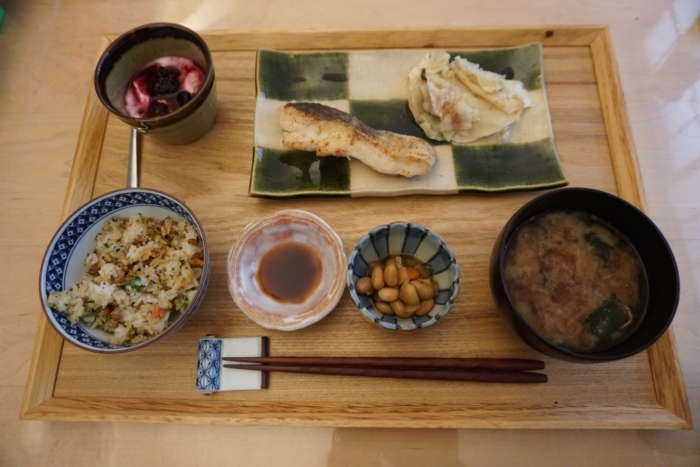 Do you enjoy Japanese home meals with my recipes? I hope so! Today, I introduce one of my family’s favorite dishes. It’s called Nikujaga in Japanese. 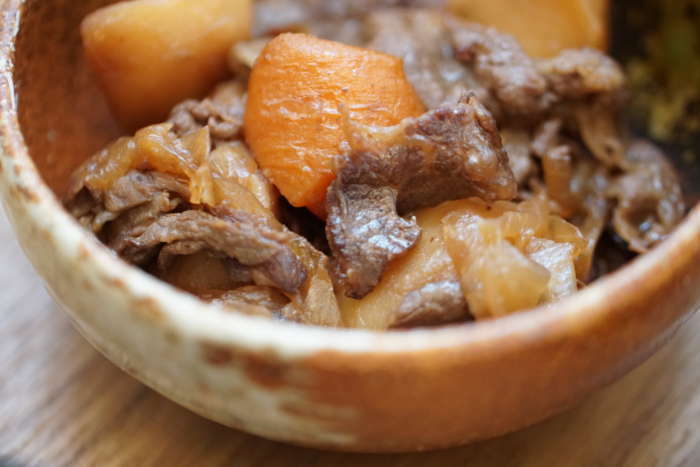 “Niku” means meat (and it’s usually Japanese beef for this dish) and “Jaga(-imo)” means potato. Other than Japanese beef and potato, there are carrot and onion. As for color and texture, I usually add green beans and Shirataki as well. Shirataki is made of special potato starch and has jelly texture. The main nutrition is fiber so you can easily be full. Cooking process is so easy. You can just cut ingredients into bite-size pieces and simmer them with seasonings. 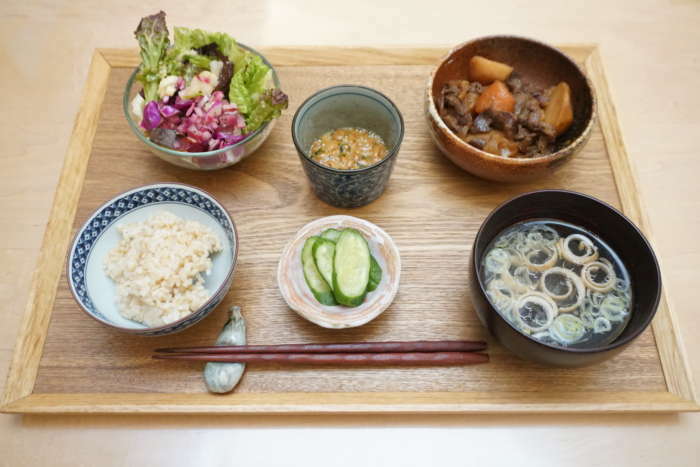 Nikujaga is known as an important Japanese home meal. It’s a bit funny but it is said that if young women she can cook this dish very well, she is ready for getting married. What an interesting and important dish! Good luck, everyone!? The other day, my family and I visited Shinjuku area on weekend. 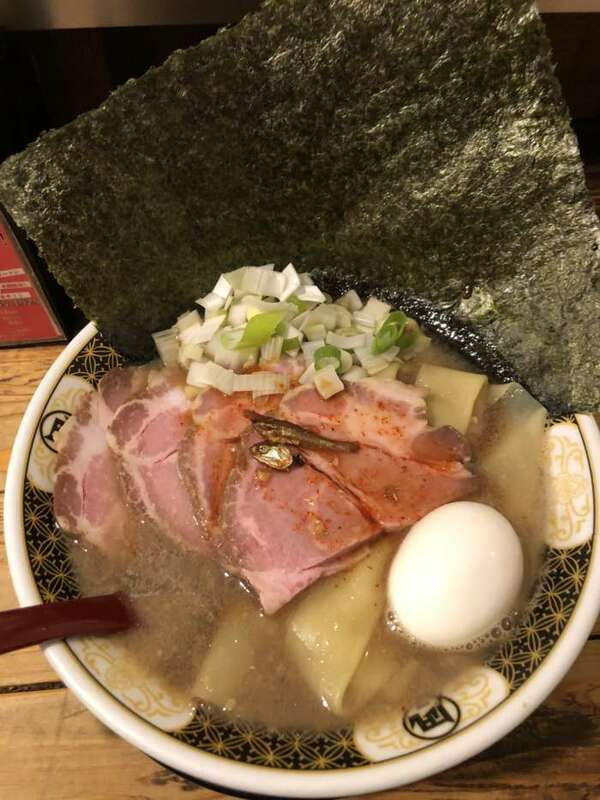 As always, I researched local ramen shops and found a “niboshi (dried small sardines) based ramen”. 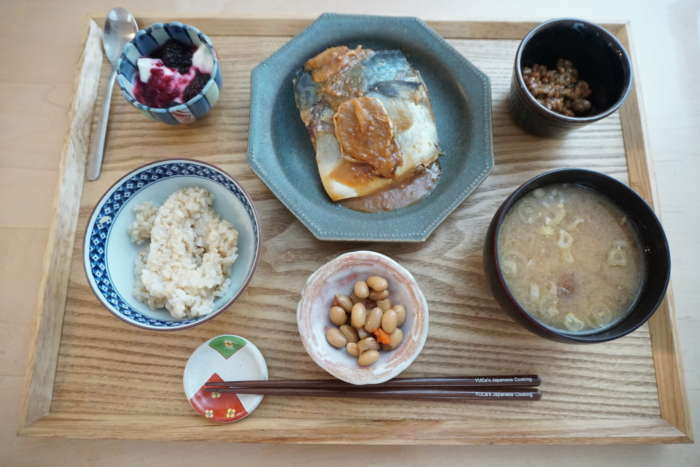 In Japan, we usually use dried small sardines to make Dashi soup broth. I like the flavor from niboshi so I decided to try. 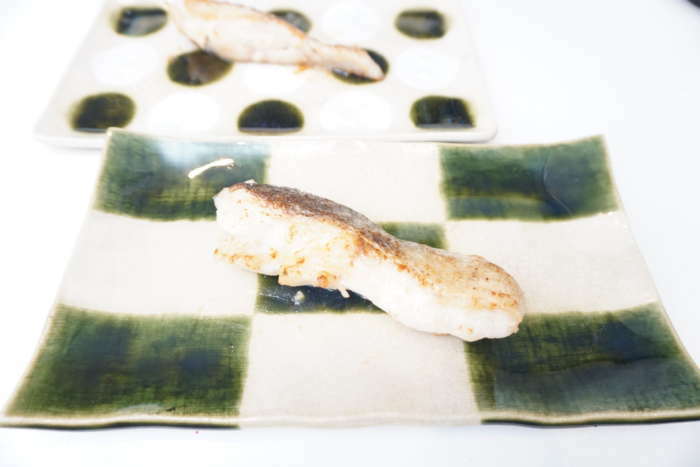 When you feel like eating fish but don’t know how to cook it, this is an easy recipe for you! You can try Teriyaki sauce that I introduced in my previous recipe, but this sauce is much easier. Yes, it’s just butter and soy sauce. This is one of the easiest, most simple and yummy sauces that I recommend. Only 3 steps! My son also loves this sauce. Please try it out!